The team is proud to announce the release of MATE Desktop 1.6. This release is a giant step forward from the 1.4 release. In this release, we have replaced many deprecated packages and libraries with new technologies available in GLib. We have also added a lot of new features to MATE. We would like to thank every MATE contributor and user. Added a simple way for distributions to override the default panel layout Unfortunately, due to migration to GSettings, you will lose your current panel layout. All other settings will be migrated if you have MateConf 1.4 installed. We asked people from distributions that ship MATE what they think about our Desktop Environment. It’s extremely important to us that people are happy with their computer. When that environment we all loved and worked hard to improve since 2006 was discontinued we weren’t happy to let it go and to ask people to migrate to something new or something different. We worked really hard on making sure our users could continue to use their computer the way they wanted and we met a team of like-minded people who had taken the initiative to support that environment and to develop it even further. Mint and MATE go hand in hand and the relationship between the teams is excellent. Mint played an important role in the promotion and backing of MATE and we continue to help with its development. We’re very pleased with MATE, it’s exactly what we wanted, it started where GNOME left off and with each new iteration it keeps getting better. We don’t like how upstream forced changes to users and want our users to have the option to decide what to use. With MATE in our repositories we are certain our users can always choose what works best for them. Ever since the release of Fedora 15 was released I was extremely unhappy and frustrated with my desktop experience until I discovered MATE. Now on Fedora I can finally have a desktop that is sane, stable, fast and most importantly easy to use. With the hard work the team has done to also patch compiz to work on the newer releases of Fedora I can now have my Fedora 14 (considered by most to be the best release of Fedora) experience back with wobbly windows, desktop cube, animations, and 3d effects. I can’t stress how big of a loss this was to many users including myself. Now with MATE I don’t have to worry about what is going to break with the next Gnome release and what crazy design ideas they are going to have making me have to relearn a desktop interface every single Fedora release. With MATE 1.6 I can feel right back at home on my favorite Linux distribution and get back to work. 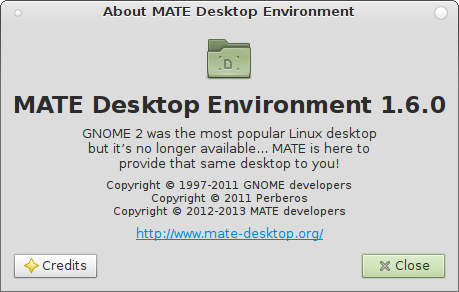 We are really happy to use the MATE Desktop Environment. This way we can keep a clean and well working desktop without lots of useless and distracting stuff. Until the end of 2012 our whole company were working with Ubuntu, but with the Unity Desktop and many other “end user features”, we were searching for new ways to get a desktop, free of software that pretends to make our lives easier. With MATE Desktop on Debian 7 Wheezy, we found a good working, high performance desktop that just works as we know it from years. We hope that the MATE Team will keep our classic Linux Desktop and bring to it new life some with new features, but with the good workflow kept in hand. So far, they have done great job, and we hope that soon the Debian Maintainers will add the MATE Desktop to their mirrors (and of course, that many others will use MATE too!). MATE 1.6 is the result of 8 months of intense development and contains 1800 contributions by 39 people, and more than 150 translators.